Cummins is one of the world's most respected designers and manufacturers of industrial diesel engines, for standby diesel generators and prime power, diesel generator systems. Cummins diesel engines have their headquarters in Columbus, Indiana and are adequately represented in approximately 190 countries through and intricate network of more than 500 company owned and independent locations. Green Power's Cummins diesel powered generators are designed with state of the art technologies to ensure that they are reliable and efficient engines for prime/standby power generation applications. 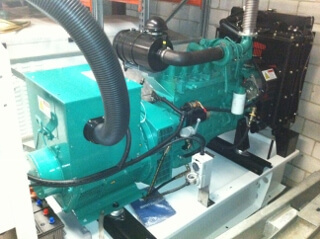 When you select a Cummins diesel engine for your Green Power Generator, you can be ensured that our extensive knowledge, combined with our understanding of how each component works best with that engine when coupled together, we will design and produce your generator to the correct power required during operation and under high electric starting loads. Whether you require a 240V, 416V or 480V powered generator in single phase, two phase or three phase Green Power can configure a unit for you, from 40 kVA to a whopping 2500 kVA. Green Power recommends Cummins diesel engines for their range of large diesel generators. All our diesel generator sets are fully load tested to 100% for 2 hours before it leaves our premises. Every one of our diesel generator sets come complete ready to run with oil, coolant, and a new starting battery. Delivery can be organised for anywhere in Australia.